Benedict Cumberbatch is Alan Turing, a man intent on deciphering the enigma code used by the Germans in WW2. In playing Turing, Cumberbatch is the actor who has cracked the code for guaranteeing an Oscar nomination. Turing here is portrayed as being on the Autistic spectrum, finding it difficult to make friends, understand jokes or even be able to work as part of a team. He is a genius who seemed to only have one friend in his school days and then went on to work at Bletchley Park in order to figure out how the German’s were encoding all their radio communications during World War 2. 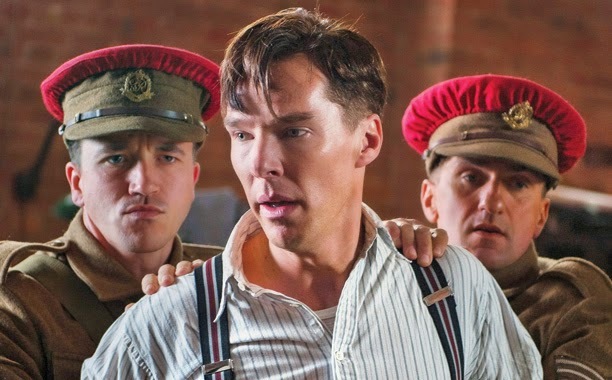 The Imitation Game deals with his time at Bletchley most notably, but also flashes back to Turing’s days being bullied at school and forward to after the war where he was eventually arrested for being a homosexual. The Imitation Game is a fascinating study of a man, who is leagues ahead of most he encounters in terms of intelligence, but struggles with personal relationships. More than that though, it is a gripping thriller that looks behind the bombings and battles of WW2 and instead investigates the men (and at least one woman) behind the curtain at Bletchley Park. These codebreakers were ultimately responsible for significantly impacting the length of the war, and also saving millions of lives. Despite not having a clue how their machines work, or what incredible calculations they are making, The Imitation Game remains riveting throughout. By mixing up the chronology, director Morten Tyldum makes what could have been another boring biopic into something more engaging and inevitably tragic. This is definitely Cumberbatch’s show, but more than just one noteworthy performance, The Imitation Game dabbles briefly but memorably into the moral quandaries of war time decision making and the abhorrent treatment of homosexuals in post-war Britain. It is a testament to the genius of Turing, but also a tragic reminder that the country he worked for turned its back on him.